A subhead on the Sun-Sentinel's gamer for last night's Senators-Panthers tilt reads, simply, "Panthers lose again with barely anyone watching." That's about right. The Panthers' ownership, entering its second season with the franchise, made its intentions known to stop hiding just how bad things are in Sunrise. In a letter to ticket-holders, the co-owners declared the team "[has] lost tremendous amounts of money over the last dozen years." (Why yes, they'd like some taxpayer money from Broward County.) Midway through last year, they began tarping off entire sections of the BB&T Center to goose arena capacity. Most notably, this season the Panthers have done away with all the discounted and freebie tickets the team has used in the past to get to a somewhat respectable gate figure. No more. Last night's announced attendance for the second home game of the year was 7,311, down nearly 30 percent from the previous franchise low set in 2007. It's going to be a long season. I'm not sharing this to make fun of the fan base—no one is ever under any obligation to spend money on a sporting event, and the Panthers, despite trending upward, historically haven't given fans many reasons to get excited. But look at these photos from last night's game. 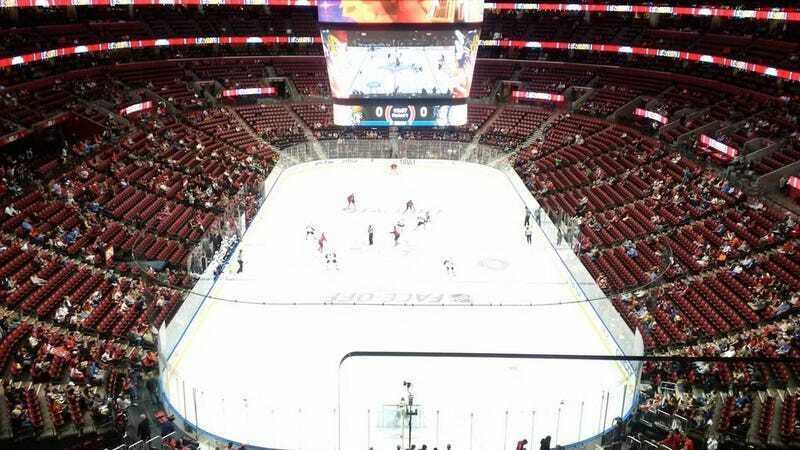 Whatever the NHL's plan for South Florida, it's not working.